Thank you for visiting NYC Jazz Workshop, the home page for all educational activities of the pianist, composer, and arts administrator Antonio Ciacca. Antonio offers a wide range of workshops throughout the world, covering such topics as jazz piano, composing and arranging, big band coaching, and music business. Drawing on Antonio's singular talents and wide industry knowledge, these workshops are highly recommended for artists of all ages and skill sets. Born in Germany, raised in Italy and educated in the United States, pianist, composer, and arts administrator Antonio Ciacca has established himself as an indomitable artist, consummate musician, and powerful advocate of the jazz tradition. Ciacca began his career as a sideman for such acclaimed jazz artists as Art Farmer, James Moody, Lee Konitz, Jonny Griffin, Mark Murphy, Dave Liebman, Steve Grossman and Benny Golson. It was Grossman’s influence—with whom he studied for three years beginning in 1990—that particularly nurtured Ciacca’s own development. In 1993, Ciacca moved to Detroit to study at Wayne State University with Kenny Barron, after which he studied privately with Jackie Byard in New York. Whilst living in Detroit, he was first exposed to gospel music, an influence he soon integrated it into his own developing style as a composer and performer; Ciacca eventually went on to produce a CD for the Detroit Gospel Singers. 1997 proved a watershed year for Ciacca, as legendary saxophonist Steve Lacy invited Ciacca to join his quartet, a collaboration that would last for seven years. The same year, Antonio Ciacca met Wynton Marsalis, who was performing in Italy with Elvin Jones. This meeting laid the foundation for a friendship and musical collaboration that continued through their work together at Jazz at Lincoln Center. The following year, Ciacca began performing with saxophonist Benny Golson, with whom he continues to collaborate. In 2007, Ciacca’s extensive music industry experience and comprehensive artistic vision led to his being tapped to take on the position of Director of Programming at Jazz at Lincoln Center, a role he held until 2011. Ciacca has expanded his role into new entrepreneurial ventures to promote his music. Establishing himself as the Artist in Resident at New York City’s Setai Hotel, he has curated one of the most exciting nightly jazz series in New York, and has partnered the venue in unique musical events, including the “Remembering Bud” Jazz Festival and Italian Jazz Days. Throughout his career, Ciacca has served as a tireless jazz advocate and educator, and in 2009 expanded this role as he began teaching “Business of Jazz” at the esteemed Juilliard School of Music in New York. 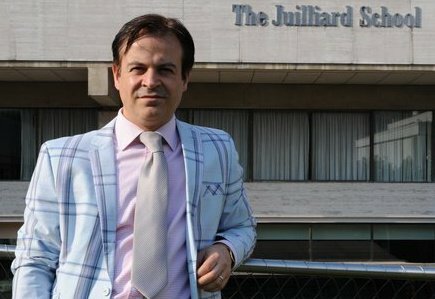 In addition to teaching at Juilliard, Ciacca is an active lecturer throughout the United States and Europe, conducting numerous workshops on jazz business, on piano technique, and on ensemble work. As a bandleader, Ciacca’s work is documented in six highly acclaimed solo albums. His debut album, Driemoty, was released on the C-Jam label in 1995. Most recently, Ciacca has formed a close relationship with the American label Motema, for whom he has recorded two albums: Rush Life in 2008 and Lagos Blues—featuring Ciacca’s mentor Steve Grossman—in 2010. Ciacca’s skills as a vital composer are also documented in music books: The Music of Antonio Ciacca, Vol. 1, as well as the companion books to Driemoty and to Lagos Blues.